Flu season is above peak levels right now and your workplace is one of the number one places where you can catch it. 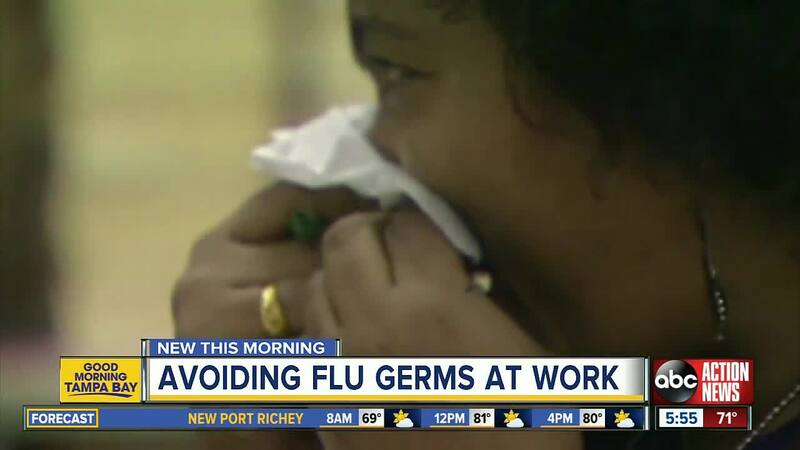 TAMPA, Fla. — Flu season is above peak levels right now and your workplace is one of the number one places where you can catch it. "You want to disinfect the whole chair," said Charlie Rodriguez from OpenWorks, talking about chairs in the conference room. OpenWorks is a company that does commercial cleaning. Rodriguez says office spaces are one of the most likely places to catch the flu. "It’s very simple to get the flu by just touching a door handle and then eating your lunch five minutes later," said Rodriguez. Many can attest when one person in the office gets sick, it doesn’t take long for it to spread like wildfire. "The flu virus can stay on a surface from 24- 48 hours, so it's pretty scary," said Rodriguez. Right now, the flu is widespread across the entire nation and is above peak levels here in Florida. Rodriguez says that’s why it's so important to disinfect everything that people touch. "Make sure that if you know someone is sick you let your cleaning crew know so they can disinfect everything,"
Everything like door handles, chairs, conference tables, the coffee machine, and the water cooler. Basically, everything that people touch. "They can have disinfectant wipes on the desk so they can clean their desk themselves," said Rodriguez. The flu is most commonly spread from the hands to the mouth so experts say to avoid touching your face and wash your hands frequently. But the best way to avoid spreading sickness around the office. "Stay home from work if you’re sick," said Rodriguez.